A very sad day today as we farewelled our quilting sister Trudy who died on Sunday. I have put this off since that day because I didn’t want to think about her being gone. Trudy was a lovely lady who had a real zest for life and struggled through the awful illness of cancer with grace and humour. At her funeral today she was described as a wonderful mother and grandmother, courageous and loyal – phrases often used at this type of gathering. But these weren’t just throwaway lines – Trudy was really special. 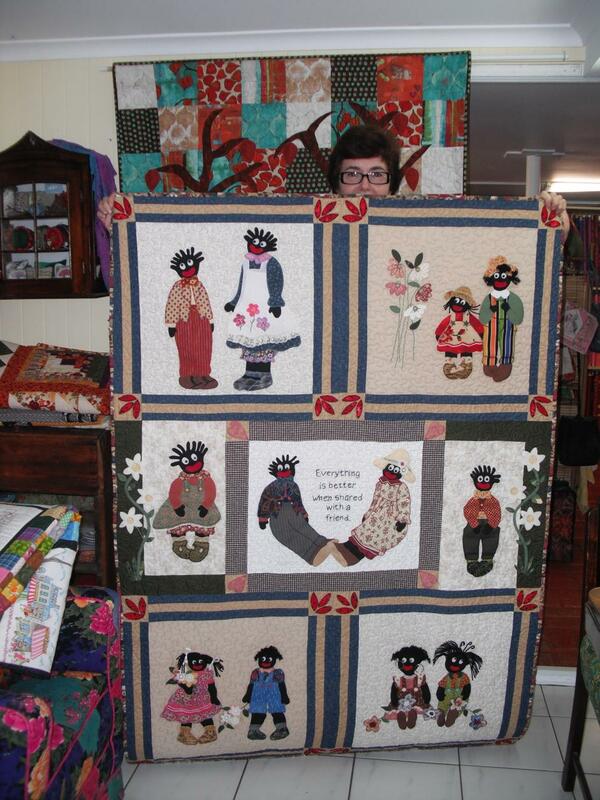 She often said that quilting inspired her and helped her make it through some tough days. In fact her coffin was draped with a teddy bear quilt she made when she was at her sickest (that really set us Apatchy girls off when we saw it). What we tried to tell her was that she inspired us – which is why she won the inaugural Apatchy Geronimo Award. 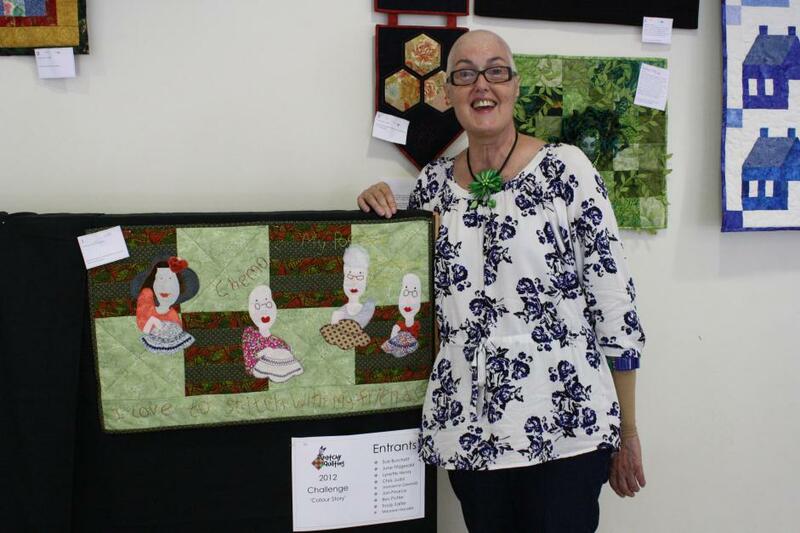 This award was presented to her at the Christmas party last year where she also won the Viewer’s Choice award for her challenge quilt – a quilt that she finished even though she was suffering badly with the illness. We were amazed that she could persist and what determination she had. When others said they were ‘too busy’ or ‘couldn’t finish anything in time’ she just went right on and got on with it. It put many of us to shame. In fact her challenge quilt from the year before is in this year’s calendar – rather aptly her quilt is the feauture for this month. For me personally – she certainly inspired me to re-think life and to make the most of it. I have taken up Gretchen Rubin’s Happiness Project – partly due to Trudy’s example – and have done things this year that I have always wanted to do (like taking singing lessons). It’s because of her that I use my good china and don’t keep it hidden away in a cupboard to be used “one day” and that I really try to make every day count – just like she did. It still doesn’t seem quite right that we won’t hear her funny laugh again or see the joy she had for quilt classes. Trudy was our dear friend and we will miss her terribly. Witty, caring, sharing, loving, talented,and, most of all, truly inspirational. It is such a shame that Trudy was in our lives for such a short time. She will never be forgotten. Though a Tuesday night gal, on the occassions I met up with Trudy, her grace and dignity in adversity could not but move you. I shall all always remember her smile. A great spirit, a great lady and a great inspiration. Trudy was one of the first to make me feel truly welcome and she was always so appraising of everyone’s work. She will be greatly missed but I feel privilaged to have had the chance to know her.